Various offenses that New Jersey defines involve efforts to obtain a benfit, either for oneself or for others. Alternatively, some New Jersey offenses involve efforts to injure another, or to deprive another of a benefit. Other pages on this site describe many of these types of offenses. A special situation exists, however, when these offenses are committed by someone who works for the government. New Jersey's official misconduct statute refers to government workers as “public servants.” If the offense “touches upon” the office that the public servant holds, then a separate offense exists. That separate offense is called “official misconduct.” New Jersey defines official misconduct at N.J.S. 2C:30-2. In order to put all this into sharper focus, let's look at three specific examples. Example One: A building inspector solicits a bribe to overlook code violations. 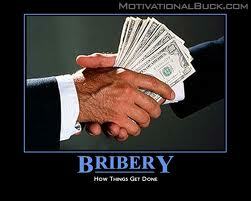 That building inspector is guilty of attempted bribery. But he is also guilty of the additional crime of official misconduct. This additional crime arises from the fact that it was the inspector's government position that put him in a position to solicit the bribe in the first place, and the solicited bribe related directly to the official's government function. Example Two: The purchasing officer for XYZ corporation tells ABC supplier that he will steer business to ABC provided that his son and daughter-in-law get box seats for all Yankee games for the entire season. This purchasing officer is guilty of commercial bribery. He is not, however, guilty of official misconduct. What makes the purchasing office not guilty of official misconduct is that the position that enabled him to commit his misdeed was in the private sector, as opposed to being in government. Example Three: A member of the New Jersey Legislature gets angry at her husband and strikes him with a tire iron. This can make the member guilty of various offenses. Those offenses could include unlawful possession of a weapon; possession of a weapon for an unlawful purpose; aggravated assault; simple assault; perhaps murder or attempted murder. Her actions would not, however, constitute official misconduct. The reason official misconduct is not implicated here is because, even though the legislator holds public office, her misdeeds do not “touch upon” that office, or her official duties. Her acts against her husband occurred in a setting apart from any official duties imposed by her government position. Official misconduct in New Jersey can also occur when a government official refrains from performing a duty that his position obliges him to perform. This refraining must, however, be for one of the specified purposes imposed by the New Jersey official misconduct statute. That is, his refraining must be for the specific purpose of obtaining a benefit for himself or others, or for the purpose of injuring another, or depriving him of a benefit. An example of this might be where our building inspector refrains from issuing a certificate of occupancy solely on account of a personal grudge that the inspector holds against the applicant. Under, N.J.S. 2C:30-2, official misconduct can be committed only by a public servant. “Public servant” means any officer or employee of government. “Government” includes any branch, subdivision, or agency of New Jersey, or any county or town within it. In all instances, official misconduct occurs only when the public servant knows that his action is unauthorized, or that he is commiting an authorized act, but in an unauthorized manner. An act is unauthorized if it is committed in breach of some prescribed duty of the public servant's office. This duty must be official and non-discretionary. It must be a duty imposed upon the public servant by law. Examples of such law are statute, regulation, or ordinance. It must be a duty that is clearly inherent in the nature of his office. The duty to act must be so clear that the public servant is on notice as to the standards that he must meet. The failure to act must be more than a failure to exhibit good judgment. And New Jersey must prove that the public servant knew of the existence of his non-discretionary duty to act prior to the incident in question. Official misconduct in New Jersey is a second degree crime. “Second degree” in New Jersey is very serious, just one degree lower than offenses such as armed robbery, aggravated sexual assault, and kidnapping. Persons found guilty of second degree crimes are virtually certain of being sentenced to imprisonment. However, when benefit conferred does not exceed $200.00, then official misconduct in New Jersey is a third degree crime. In that instance, there is a likelihood that imprisonment may be avoided. Allan Marain and Norman Epting, Jr. are New Jersey criminal defense lawyers. Their combined experience exceeds sixty-five years. Each has successfully guided thousands of New Jersey clients through first-, second-, third-, and fourth degree charges. They have successfully defended charges of both “street crimes” and so-called white collar crimes like official misconduct. If you have been charged with an offense in New Jersey, either State or federal, each is available to review your situation in a private, confidential, no-obligation conference. They would welcome your call. Page last updated 20 August 2017, and displayed Thursday 18 April 2019, at 06:51:25 EDT.